Van Gaal says that his philosophy is what matters most, while the formation matters less. But besides that, he will use a 3-4-1-2 and this decision is, comparable to his decision prior the World Cup, because of a desire to give his No. 10 and both strikers as much freedom as possible. They can play as a line or with a deeper No. 10. Nevertheless, Van Gaal will ask his three attacking players to press high up the pitch, while two centre midfielders will cover the space behind them. United have a so called ‘unbalanced squad’. Van Gaal said he has too many strikers and No. 10s. In a 4-2-3-1 Van Persie would play as a lone striker, Rooney would be used in the hole behind him and Juan Mata or Shinji Kagawa or Adnan Januzaj or Danny Welbeck could not be used in their favourite role. But on the other side using the 3-4-1-2 means some of Manchester United’s wingers will be benched. With Van Gaal confirming a switch to 3-4-1-2 formation, he will only accommodate two wide players. There is only one wide player on each flank and the wing-back has to maintain the width for his side and is receiving – loosely speaking – no help from a winger. Therefore, the Dutch tactician needs Luke Shaw on the left side. The former Southampton left-back is a prototype never losing a territorial battle on his flank, carrying position very aggressively and being confident on the ball. Shaw likes to knock the ball into space and he will give Manchester United the velocity they need. In his first season at Old Trafford he will become a more balanced player and a better defender in Van Gaal’s formation of choice. It is now Van Gaal’s task to find roles for out-of-positions players such as Nani, Wilfried Zaha and Ashley Young. The latter seems to be the choice to play as a wing-back. Young is more versatile and he contains more variety than orthodox right winger Antonio Valencia. Some of the wingers will be able to adapt to the role of wing-back and will face competition for the wing-back positions from the club’s fullbacks such as Luke Shaw and Rafael. It may be that Zaha is able to convince van Gaal of his attacking talent and can compete with Rooney, Mata and Januzaj for the central attacking positions. Those who will not be able to adapt will have to leave the club. The process of squad renewal is already in motion. Vidić, Ferdinand and Evra left at their own request, while Shaw and Herrera are now on board. Ander Herrera is a young footballer who has developed massively in the last seasons. He has been playing as a central midfielder at a high level. At Athletic Bilbao, he has shown that he is a mature playmaker, very dynamic and technically gifted. He is bringing Manchester United the creativity in centre spaces they have lacked over the last years. Furthermore, Van Gaal will ask his players to press high up the pitch and Herrera could lead the midfield pressing. By the side of a fully-fit Darren Fletcher he could provide box-to-box influence and be the new dominant playmaker at Old Trafford. Herrera’s energy and playmaking from deep means he’ll be perfectly suited alongside a more static and physical player. If formations are named after the way in which the players are positioned in the defensive phase, the Red Devils surely play a 5-3-2. However, Van Gaal instructs Manchester United to retreat into a back five only as part of a deep block after the high block has been bypassed. Manchester United offensively play a 3-4-1-2/3-5-2. Van Gaal needs defenders who are completely comfortable with the ball, who can play accurate passes out to the flanks, who can move out wide. On the left side of defence, Evans can play long-range passes and the 26-year-old can be a playmaker within the back three. However, there is still the lack of left-footed defenders. Because of that, Manchester United’s interest in signing Thomas Vermaelen seems logical. On the right side, Phil Jones has the necessary skills to defend his side and to take the ball constantly forward. Chris Smalling has surprisingly found his role in the middle of defence. He usually receives the first ball, but never plays through the channels. The 24-year-old has to decrease his nervousness on the ball. Alternatively, Michael Carrick could fill the central position as back up to Smalling, who could also play on the right side. Build-up play: Evans on the ball. Herrera usually drops deep to pick the ball up in the defensive third. The build-up begins with David de Gea playing out of the back. The Spanish goalkeeper passes to either of the three central defenders, who fan out across the full width of the pitch. Ander Herrera drops close to the defence in the build-up. Therefore, he is available for a pass if a defender is closed down on one side. Darren Fletcher basically holds the position before Herrera in the central midfield. Fletcher is mostly set to the right side, while Juan Mata fills the space between Herrera and Fletcher. Manchester United’s No. 10 can drop deep and roam in front of the back three. During the final stage the two forwards concentrate on spaces up front, while both wing-backs move in advanced positions. 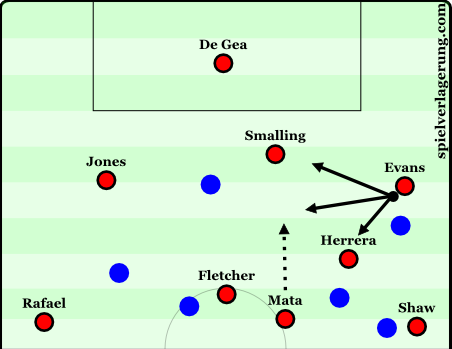 Shaw and Rafael (or Valencia) will usually rush forward in an early stage of attack. The result is much free space behind the two wing-backs. Van Gaal will ask his wide centre-backs to be in a position to cover the adventurous team-mates. Herrera sits as the deepest of the three in the middle of the pitch, allowing Mata or Kagawa or Januzaj to utilise their explosive energy levels to make runs into the final third. Mata enjoys a free role, providing ball circulation in the first and middle third and roaming through the final third to disassemble defences. Van Gaal wants to control the middle ground, playing the ball box-to-box, while both wing-backs and both wide centre-backs maintain the team’s balance and provide width. Van Gaal has plenty of choices to fill the attacking positions. Either Van Persie could be flanked by two team-mates able to link-up with the midfield and the wing-backs or Van Persie and Rooney could move up front, while Mata fills a deeper role. The Spaniard can retreat alongside the central midfielders and ensures another option when the centre-backs play out from the back. Van Gaal criticized the ‘unbalanced squad’, but the Dutch tactician can use the likes of Welbeck, Chicharito or Zaha as second striker. Despite nice build-up play and passing from Mata and Herrera, Manchester United have to capitalise on the space their midfielders are creating and a fit Robin van Persie remains a great finisher and could make the difference. Van Gaal’s Netherlands struggled to break down teams that defend deep and ruthless at the World Cup and Manchester United’s domestic rivals are likely to have noticed. 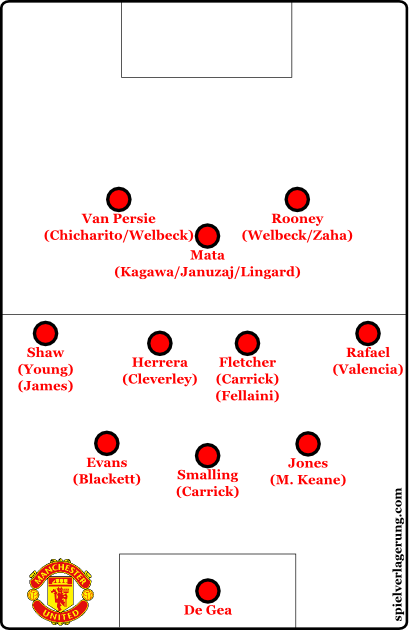 On the other hand, a highly attacking formation could force the wing-backs to carry out greater defensive work and both Shaw and Rafael could struggle against overloads down the flanks due to the lack of team-mates ahead of them. At the end it’s impossible to say whether Van Gaal’s 3-4-1-2 and his philosophy will thrive in the next season. But we will observe Manchester United’s progress. I remember after the 98 world cup and Germany’s early ouster, everybody said the 4-4-2 is the system of the future and that it was inconceivable you could compete at top level with 3-5-2 and man-marking. And yet, that is what many teams now do, the number 6 has evolved into a libero (De Rossi at european championship 2012, now Alonso at Munich etc. ), and van Gaal uses man-marking in midfield (so did Chile at the world cup and knocked out Spain). I thought consensus was that with man-marking you take your own players out of the game? Could anyone explain what happened to make this possible? Nice work. Interesting to read, especially the last part where you touched and adressed the weaknesses of the new system. Fantastic article…just replace Man U with Bayern Munich, Van Gaal with Pepe Guariolla…tactically identical. Thank you for that. And even if the players could easily be interchanged even the basic formations could not be! But that are just general remarks in the beginning of the article that would also fit Rayo Vallecano!! And point two actually would not fit with Bayern Munich. So three quarters of four general remarks in the beginning of the article would fit. I do not call that identical.